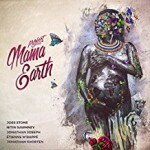 Share the post "Album review: PROJECT MAMA EARTH – Mama Earth"
The thematically titled ‘Mama Earth’, is an all-star collaboration featuring Joss Stone on vocals, Nitin Sawheny on guitar, Jonathan Joseph on drums, Etienne M’Bappe on bass and Jonathan Shorten on keyboards. It’s a stellar line-up that takes its cultural point of departure from the ancient Cameroonian rhythms of Mangambe and Bikutsi in particular and funk in general, while drummer Jonathan Joseph’s drive and spark explores the full gamut of Afro rhythms. He generates the kind of spontaneous combustion that jammers can only dream about, while Joss Stones’s ethereal phrasing is a perfect foil as she twists and turns the grooves to her own ends. ‘Mama Earth’ challenges given musical genres and takes the leap of faith that wherever the creative muse goes, the musicians have the ability to follow. The histo-cultural traditions that underpin this project have in part been explored before in the jazz field, but not with the same open ended approach. The album grows by degrees and builds from the opening solid arrangement of the title track, on which everyone plays their part in an funky rhythmic tableaux well suited to Stones’s contemporary r&b style. There’s a Latino feel to the horns and an unexpected tempo change, confirming the band’s adventurous approach. ‘Interlude 1′ is the first of 5 conceptual interludes that helps colour the bigger picture, before we are into ‘Waterfall’ which has a more straight ahead rock feel, as Stones’s vocal swoops and impassioned performance works hard to make a connection with juddering rhythms. ‘Spring’ opens with a different rhythmic pattern and ushers in more Stones extemporisation over bv’s and a sparkling horn arrangement . Unsurprisingly, given the spontaneous approach not all the album consistently reaches the heights, but as we get deeper into the album, everything starts to gel, particular on ‘What Would You say’ when her phrasing comes to rest on some stop-start jazzy guitar lines, cymbal crashes and funky rhythms. In between a combination of slick changes andcool Steely Dan style horns she subtly shifts from frontline to bv’s and back again. The running water and percussive chimes (or are they cow bells?) of ‘Interlude 4′ anchors the theme of mother earth, before ‘Entanglement’ – arguably the best track on the album – on which she really comes into her own with some expressive phrasing as she celebrates the interconnectness of everything on an aptly titled song. The whole album is encapsulated from the 2 and half minute mark of a track when the all -star ensemble morphs into one with a seamless musical focus. It’s moments like this that are frequently romanticised, but all to rarely achieved. But there’s more, as some delicate bird song and an acoustic interlude serves to draw us into the meditative ’Breath’. It’s the perfect meeting of subtly voiced rhythms – a tabla and fretless bass style sound – melded with an evocative vocal which demands total immersion in the music. ‘Mama Earth’ is a very ambituous and honest album. Up to the half way point it’s a well played mix of Afro fusion with r&b trappings which you might file under well played and worthy. But then something special kicks in on ‘Spring’. And as the textures and colours bubble up, the horns kick in and Stones effortlessly hits a top note, the whole project slips up a gear. A subtle drop-down of dappled bass notes, muted trumpet and gentle voice bursts forth into the defining line: ”Spring has sprung on me”, as the music directly evokes the celebratory mood of the lyrics. This entry was posted in ALBUM REVIEWS, ALBUM REVIEWS (Mobile), All Posts and tagged Afro fusion, album, Bikutsi, Billy Cobham, Etienne M'Bappe, funk, Jonathan Joseph, Jonathan Shorten, Joss Stone, Mama Earth, Mangambe, Nitin Sawheny, Project Mama Earth, R&B, review, rock. Bookmark the permalink.